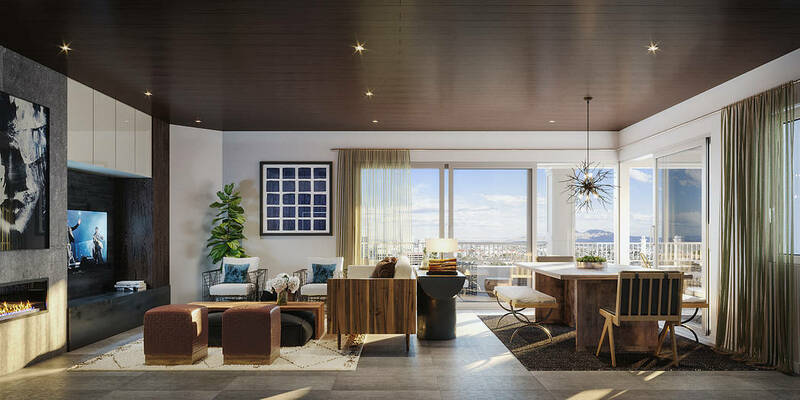 With views from the Red Rock Canyon National Conservation Area to the Las Vegas Strip, the private resort-style condominium community of Mira Villa will open its doors to a new era. Toll Brothers is building new luxury condominiums in the Canyons Village of the Summerlin, overlooking the Angel Park championship golf course. “We’re refreshing the community with 19 new buildings that are in keeping with the neighborhood’s gorgeous Tuscan design on the outside, but with spectacular new modern designs on the inside,” said Colleen McCullough, area sales manager. Mira Villa’s sales center will open Aug. 25 and attendees will be able to walk through a vignette of a kitchen and master bath, as well as take an immersive virtual reality tour of the entire Mira Villa community. Guests will be able to virtually explore all five of the available home designs, which range from 2,052 square feet to just under 4,000 square feet. An elegant collection of 103 mid-rise luxury condominiums, the home designs offer elevated single-level living with direct elevator access, gourmet kitchens, master suites and private garage parking. All the condominiums have covered verandas, including some that span three sides of the home. The community also will feature 11 penthouses with nearly 4,000 square feet of living space, including expansive verandas that offer multiple panoramic view points of the surrounding mountain and city skylines. Homebuyers are afforded the chance to work with a professional designer at the builder’s design studio to select everything from paint colors to hardware to countertops and lighting to make their homes uniquely their own. Lushly landscaped and surrounded by palm trees, Mira Villa offers numerous amenities, including a community pool, fitness center, clubhouse, multiple spa and park areas and walking paths. A gated community, Mira Villa is nearby Tivoli Village and Boca Park shopping and dining, and major roadways. Toll Brothers is an award-winning Fortune 500 company founded in 1967. It is building in 20 states nationwide and is a publicly owned company. For four years in a row, Toll Brothers has been ranked the No. 1 Home Builder Worldwide on the Fortune magazine “World’s Most Admired Companies” list. Toll Brothers also has been honored as national Builder of the Year by Builder magazine, and was twice named national Builder of the Year by Professional Builder magazine. Toll Brothers builds luxury single-family detached and attached home communities; master planned luxury residential; resort-style golf communities; and urban mid- and high-rise communities, principally on land it develops and improves. The company operates its own architectural, engineering, mortgage, title, land development and land sale, golf course development and management, home security, and landscape subsidiaries. It also operates its own lumber distribution and house component assembly and manufacturing operations. Through its Gibraltar Capital and Asset Management joint venture, the company provides builders and developers with land banking and joint venture capital. It acquires and develops rental apartment and commercial properties through Toll Brothers Apartment Living, Toll Brothers Campus Living and the affiliated Toll Brothers Realty Trust, and develops urban low-, mid-, and high-rise for-sale condominiums through Toll Brothers City Living.